Destination is a state of mind. A tale of a person and a bike and the road ahead. Kino wanders around the world on the back of Hermes – an unusual, talking, anthropomorphic motorcycle – only staying in each country for three days. "The world is not beautiful, therefore it is..."
A beautiful journal of an adventurer's journey which has a lot of fantasy element but realistic at the same time. It focuses on human nature and relations with other. Each story leaves the reader with something to think about without lecturing the reader by giving a conclusion. 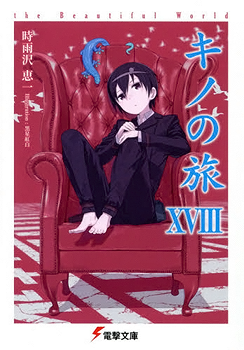 Kino's Journey is my all-time favourite piece of writing and what got me into light novels and web novels in the first place. It has a very similar atmosphere to Mushishi, exploring a beautifully created, fantastical world and its residents in an episodic format, with a somewhat detached protagonist who acts like a temporary observer rather than a resident of every place they visit. The difference is that Kino's Journey has a more cynical undertone and Kino is very different from Ginko. This is a really great novel which details the journey of a girl and her motorcycle. Each chapter is a new story where every country has something new and fascinating (or just really creepy). It's definitely a great reading material, though it can get dark at times.